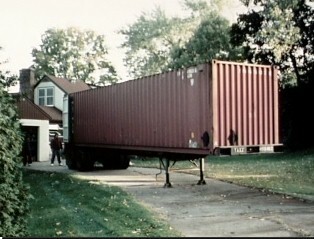 We're in the final stretch of getting all items that we want to ship to Malawi together and loaded. A container similar to the one on the left will be loaded Friday, February 23 and Sunday, February 25th for Monday, February 26th departure to Malawi. The container will be loaded Friday, February 23 and Sunday, February 25 for departure to Malawi on Monday, February 26th. We have about 35,000 pounds of much needed food and medical supplies and equipment for the new Malakia Clinic run by Gladstone and Alice Chonde in Lilongwe, Malawi who have done a marvelous service providing healthcare for their area of about 15,000 people. Without support from us thousands of people would be denied even the simplest health care. In the last days in advance of shipping this container, we have had quite a number of last-minute expenses totaling close to $3 to $4,000 which is quite normal on a large shipment like this. Most items have been donated and we are very grateful, but there are still last minute items we had to buy. Any contributions to LifeNets for these expenses would be most welcome. The first part of November we have been able to get some much needed equipment for the container going to Malawi from Paul Williams Tire Company. We received ten hand crank hospital beds, four exam tables through FAME in Columbus, Indiana. They have also committed vitamins and cough syrup for children. We have received a copy machine courtesy of Linda Schreiber and the SE Minnesota UCG congregations. Many items have been given FREE, but there will be costs connected with shipping some items to the container along with costs for final food items that will be purchased at the last minute. Your support is much appreciated. In order to supply adequate hospital and medical supplies to Malawi we are arranging shipping through a United States Army Program which provides free shipping. The debarkation point will be the Minneapolis/St. Paul area as had previously been done in 1998. Collections are being done around the United States and will then be finding their way for final loading in Minneapolis/St. Paul.